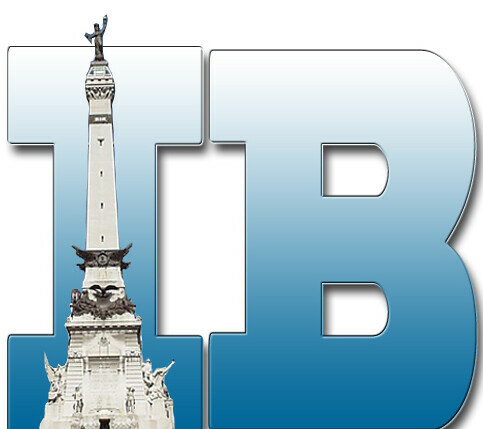 ← Indianapolis Bloggers Interview Kelley James! 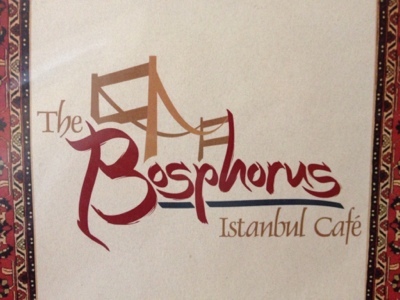 This month the girls of Global Eats Indy went to the Bosphorus Istanbul Café in downtown Indianapolis for month two of our culinary adventures. 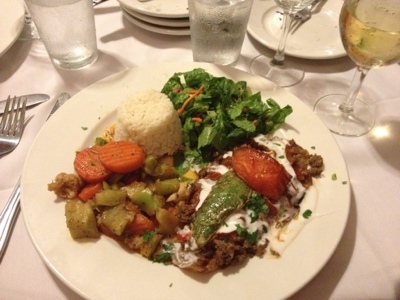 I was excited because I had never been to a Turkish restaurant and I was looking forward to the festive atmosphere, and festive it was! They had beautiful tapestries and the traditional ‘evil eye’ beads on the walls, among other decorations and they were all so cool to look at! I always love admiring other cultures’ decorations. 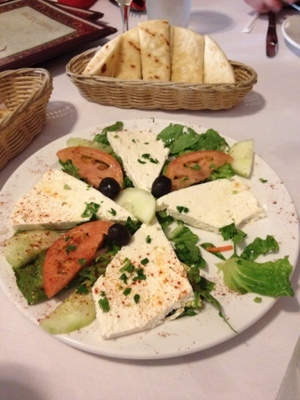 Now to the important part – the cuisine! Wait, back up…drink orders come first. And of course we had to try the traditional beverages. 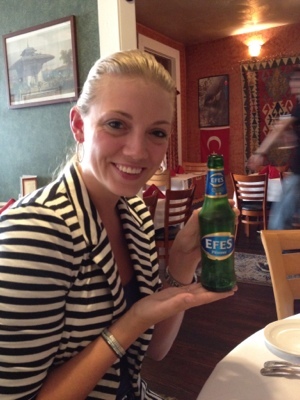 Courtney had the Efes Pilsner beer and said it was a great choice! 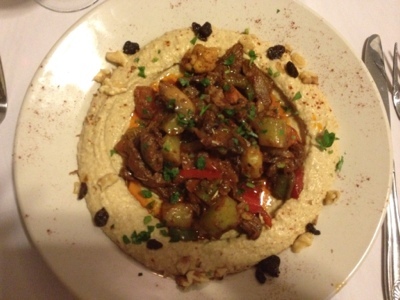 Next it was time or order, if you aren’t familiar with Turkish food, its similar to Greek in my opinion as they use a lot of lamb, yogurt, eggplant and hummus and of course pita bread as I mentioned earlier. 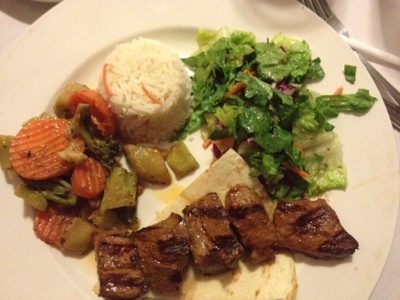 But back to dinner… check out some of the dishes we had! Everything was a hit, and the prices were good too! But the sad part was, I was reallllllyyyy hoping to save room for some baklava but I was WAY too full. Fine, twist my arm…I guess we’ll just have to go back another time! Who wants to go? All in all, Global Eats- Turkey was a success! Come join us next month! 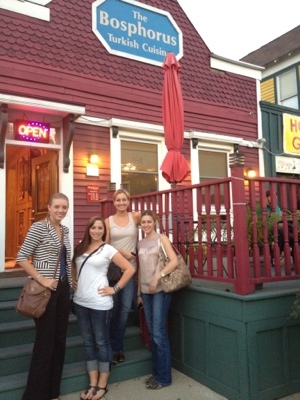 TATA Cuban Cafe here we come! 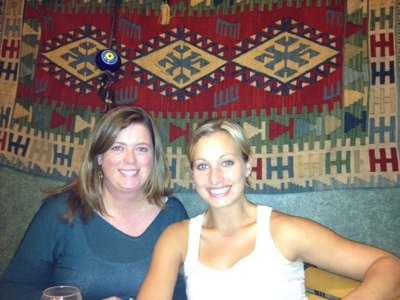 Posted on September 4, 2012, in Indy Adventures and tagged baklava, Efes Pilsner, Evil eye beads, Foodie, girls nigh, Global Eats, hummus, Indy, Restaurant, Turkey. Bookmark the permalink. 1 Comment.